The passion to photograph the rural heritage of this great country has become such a part of our lives (the very thing we live for, it seems), that it’s hard to say when it all started. But looking back, we think it started when we were kids. We weren’t thinking about photographing rural life then; we were just living it. On Sunday afternoons, we’d take drives in the country to get away from working on the farm. 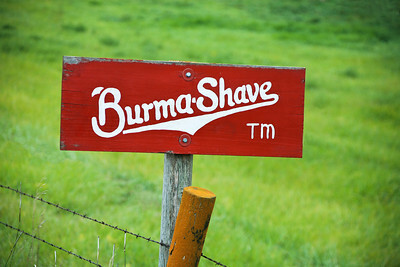 We would sit in the backseat of the family car and watch for Burma Shave signs and other interesting things along the way. We especially enjoyed any time the route took us down a curving “roller coaster” road. We lived on a farm on Elder Lane and attended a four-room Catholic school. On Sundays we’d stop by Hansberry's Store on our way home from church. When our chores were done, we’d play in the barn and outbuildings. We converted our unused hog house into an old-fashioned “mudpie bakery" and played general store with all the stuff from our cupboards when Mom wasn’t home. We had an old truck that had holes in the floorboard and a noisy muffler. But we didn’t mind because a trip in the truck meant a visit to the local feed mill where the men gathered to talk while their grain was being ground. We can still smell the grain and hear the creaking of the old wooden floor. 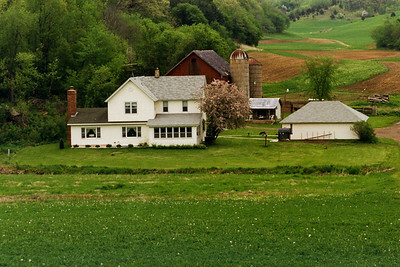 In 1992, we spent a day with relatives in the rolling countryside surrounding Spring Green, Wisconsin. This is where our ancestors settled when they came here from Germany. We passed a tiny log school that our grandfather attended. We saw a weather-worn one-room schoolhouse where our Dad and his siblings went to school. We visited the farm where they grew up and discovered our Dad’s initials carved on the inside of the barn door. Finally, we saw a sagging old log cabin that our great-grandfather had built “for his bride”. 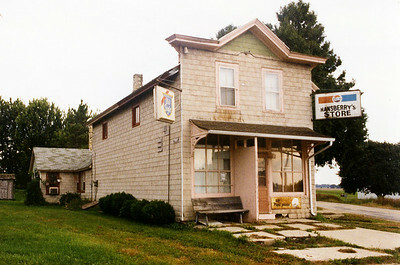 That trip lit a fire in us to photograph more of the old rural architecture and country scenes. We began taking day trips to drive the backroads and photograph old barns, farms, and mills. Sometimes when we stumble onto something on the backroads, it has already fallen into disrepair. And we regret that we didn’t find it sooner or that no one seems interested in saving it. 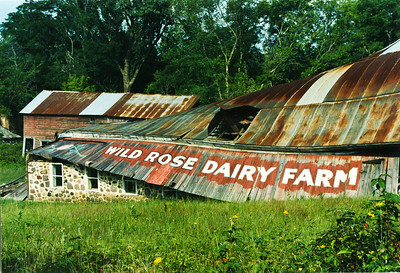 In 1998, we visited Waushara County and discovered the ruins of the Wild Rose Dairy Farm. While we were photographing it, a neighbor stopped by and explained that a storm had blown the barn down just three weeks before our visit. Sometimes, buildings are abandoned, but still in good shape. So we take as many photographs as we can, knowing that they might not be there the next time we pass through the area. Often we remember a scene fondly and return to it only to find that it has been taken over by vines and brush. Nature takes back what man abandons. So, even if the building is still there, it might not be worth photographing on subsequent visits. 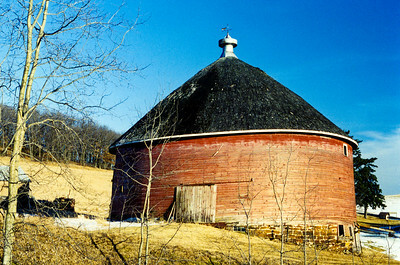 We photographed this beautiful round barn in Trempealeau County in the 1990’s. A couple of years later, there was no sign that the barn had ever been there. This compels us to push even harder to capture the rural architecture before it is only a distant memory.